NEW 'HANES" MEN'S WHITE CREW NECK T-SHIRT with RED & BLUE MENARD LOGO" ..
K#6318 HANES. 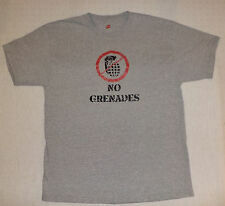 "NO GRENADES " ON FRONT. SHORT SLEEVE. GRAY T-SHIRT. If there is a problem with an item give us a chance to make it right. SIZE LARGE. (SEE PICTURE). K#2707 HANES. "NORTH CAROLINA TAR HEELS ATHLETIC DEPT" ON FRONT. GRAY T-SHIRT. If there is a problem with an item give us a chance to make it right. Color: Gray. Materials: 60% Preshrunk Cotton / 40% Polyester. Size : Large. Great overall condition. No major signs of wear. Pit to Pit-21”. 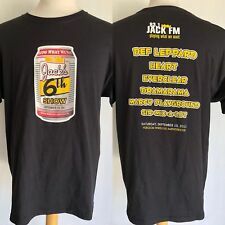 Label Size: Large. Label: Hanes Heavyweight 50/50. Chest pit-to-pit: 21". Hanes 50/50 Combed Cotton Polyester Blend Graphic shirt from he 70-80s Era. Age/Date of Manufacturer. 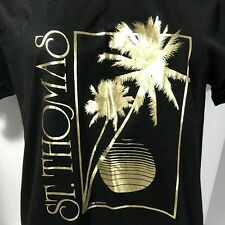 It's super soft and would make a great gift for the Vegas fan in your life. CASTAWAYS is no longer a Vegas casino so this is super rare. Dated: 80's. Material: 50% Cotton / 50% Polyester. Obviously I'm human and can miss small imperfections. Pit to pit is 21" top to bottom is 26". Inv #: Cannon C 1635 (room C). I ALWAYS HAVE RARE / UNUSUAL THINGS LISTED.
" HANES " LARGE 42-44.